The Royal Palace of Madrid is the largest castle and without a doubt one of the most beautiful and impressive throughout Europe. It is located in the western part of the center of the Spanish capital - Madrid, east of the historic city center and just a short distance from Plaza de Espania. The Royal Palace of Madrid is the official residence of the Spanish king in the capital. The Spanish royal family in general uses the smaller castle, located on the outskirts of the city for their residence. The Royal Palace of Madrid is used mainly for official state events and is owned and managed by the Agency for National Heritage. There is hardly enough words to describe the beauty and splendor of the Royal Palace of Madrid. With its total area of 135, 000 square meters has automatically been converted into the largest palace complex in the western part of the continent. There are a total of 2800 rooms and 50 halls all of which can be visited. 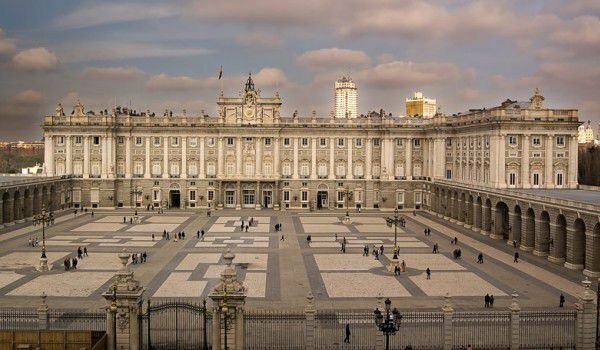 Today, visitors to the Royal Palace in the capital of Spain enter it through the big square - Plaza de la Armería. Among the rooms which are open for public visits are a large dining room that reaches 400 square meters. It is very attractive along with the China Hall and the impressive throne room, whose walls are covered with red velvet. The Royal Palace of Madrid also includes the Royal Museum of Army. It has a beautiful collection of military supplies and weapons, including armor of King Charles V. There is the battle royal arsenal of interesting weapons from the 18th century. Throughout the palace you can see works of art and amazing paintings by great artists like Velázquez, Caravaggio, Goya and others. The Royal Palace of Madrid has a rich collection of tapestries, antique furniture and porcelain. There, too, is exposed the only complete Stradivarius string quintet. Be sure to also view the gardens that are part of the Royal Palace of Madrid. They were all designed by the Italian architect, Francesco Sabatini, who arranged them in the Neo-Gothic style. The wonderful parks are riched with flower beds, ponds, fountains and statues of kings are arranged with great symmetry.